TimberSmart Regeneration Gates are an addition to our outhouse doors. Made from the same 100% recycled plastics they offer a cost effective, low maintenance and long life solution to gate needs. Manufactured from recycled polystyrene using a modified extrusion process, they can be recycled again and again. Typical components include packaging materials, milk bottles and plastic cups. 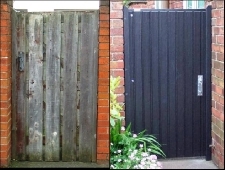 Manufactured from T&G boards, all gates are evenly coloured and have a textured surface to give the appearance of timber. Available in a variety of colours. All gates are made to measure. They will not rot and require no painting. Wash with soapy water every few months to help maintain the appearance. Hart & Co can design large volume, low maintenance gate packages to match local authority requirements.